Since my 2003 feature article in Modern Painters I've repeatedly described Portland as a "Rebel Base" because we don't have to be New York or LA, instead the healthiest attitude to take is one where we are comfortable within our own skin as an arts city. Some have publicly wondered when all this attention will "crest" or "arrive" but honestly the fact that Portland's profile has been slowly but steadily rising for perhaps a decade and a half indicates things have already arrived and will continue to do so. There is no final destination for a true arts city. Thus, we should take the opportunity to evaluate ourselves seriously and honestly at every opportunity. As it stand's Portland is a great incubator of national talent but it is the quality of individual artists and designers who are making this happen. Not necessarily our institutions, which are all making up a lot of lost ground. No time like the present to fix things though. 1)Local institutional curators much paying closer attention to what is going on in a very active scene that is internationally involved and be up to date with what is relevant in contemporary art. People across the board felt most programs are too safe and that's why programs that are supposed to address the region never seem to discover talent before national and international curators do. I feel there is a softness that is tolerated, even fetished on a conceptual or execution level which leads to a schism between those playing the Portland game and those playing with higher stakes, risks etc. You can usually tell the difference because the "Portland game" hedges its bets with many ideas and subject matter... the other, rarer stuff is more distilled, focused, less cute and stands on only what is necessary. So if the work has 10+ ok ideas floating around it and they show in a lot of regional venues... you know what's up. 2-3 great ideas that are a bit shockingly fused into something cohesive and compelling is much harder to pull off than a more scattershot sense. 2)The flexibility and relevance of grants. In particular grants that allow artists showing elsewhere to travel with their art more. It was brought up that RACC and OAC both have such grants but there is widespread dismay at how infrequently they seem to be of use. For example for Gallery Homeland's East-West Project (in Berlin) and Southern/Pacific (in Houston) no Portland artist was given funding to travel to those cities (and yes they tried). It is a black eye on funding orgs though RACC did recently fund Houston artists coming to Portland for the current Southern/Pacific show at Gallery Homeland's HQ's in town. To this fact, I suggested a suitcase fund similar to the Mary Knoll Suitcase Fund in Milwaukee. A set amount of funds is put at the discretion of several knowledgeable curators who award on merit alone and has no deadline stipulations. Sometimes things don't fall within normal grant schedules and frankly I don't think putting all funding eggs in one or two baskets is healthy. Mack Mcfarland felt RACC does a, "good job". I feel they do a very OK job at being OK (RACC bashing is easy and I want to be fair, they have improved). Still, they are too enraptured with their "process", which is not terribly good at supporting excellence when confronted with it because excellence has a way of not fitting into convenient or narrow definitions or arbitrary time restrictions. RACC has improved a great deal in supporting new media, which used to be a problem. Now it's a question if their process and panels have all that much taste and or too many restrictions? For example, when they redesigned their online process that application still does not allow uploading of images and the essays did not allow for basic things like paragraphs. They are aware of the problem... so are we. Personally, I have a hard time finding a way to even apply for grants here because the restrictions preclude their usefulness. Generally this is because there is no type of grant geared towards independent curatorial projects. Yet independent curators are a great strength of the local art scene and have been for over a decade. Fix please. 3)More arts writing and for those writers to get out more, not the same few galleries. It's true writers have habits and many writers have a circle of friends and venues they are most comfortable with. I try to see as many shows as possible (about 200 a month) and actively seek out new groups who have the gumption to create new venues. I urge all other critics in town to do the same. A crisis in criticism was mentioned but frankly I've never bought that. Curators and artists often think arts writing is a magic bullet but the fact is the patronage in arts has shifted to a market model. Unless patrons pay attention to criticism it has no effect. That said engaged, consistent and knowledgeable criticism that takes an informed... non milquetoast stance does galvanize discussion. Still more arts writing is a good thing, though as a writer I'm very aware that most artists feel good art writing simply parrots their artist statement and heaps on praise. That is not criticism and the fact is an art critic is a very very rare animal, and always has been even in the best of times. Though Ive been a national juror for the Andy Warhol Arts Writing Grants I myself have never received a grant for art writing (I was a finalist in 2008 for RACC's literary Fellowship though).... fact is critics are the janitors of the literary world and arts writing doesn't get funding because politically its like robbing the poets/novelists and giving a prize to the visual art enclave. You want more arts writing it will take cash and even then it will never be enough. The rarity of true art critics vs. gladhanding types is partly what makes this a perennial subject. Especially for those who are not critics themselves. 4)Patrons willing to publicly acquire challenging work and display it. We know Portlanders tend to be a very polite lot but it is important to be outwardly supportive. 5)More honesty. Instead of polite silence or faint praise, everyone should give their opinions a bit more freely without fear of reprisal. Respect honesty by expecting honest criticism... getting defensive is a problem. 6)Modou Dieng felt a major internationally focused biennial would improve Portland's international profile by encouraging exchange and give artists, curators and critics a destination. Yes it would. 7)Press releases should be concise and helpfully descriptive... i.e. inviting to potential viewers rather than code for an inside clique. 8)Generally take what you do more seriously. Don't try to be a major arts organization without a board, don't be a contemporary art award and not be contemporary. Don't make the excuse that nobody cares about what goes on in Portland, because obviously Portlanders do and in fact all the international attention indicates that the rest of the world has us in their sights. We have a leadership role to take with the arts and things like the CAN initiative can change things... especially if we apply higher expectations across the board. 9)There was a discussion of what defines "success" for Portland. Modou felt things like the Portland 2012 Biennial were ok but amounted to artists showing with their neighbors and an international biennial has more relevance. I agree with that. When you have so many artists in a show it has no effect, it becomes a community event not a critical discussion of what is crucial. I stated something about defining success as a great artist or two whose quality transforms community expectations. Institutions are fine but they are built on the excellence of specific individuals (even MOMA was built upon the work of Alfred Barr who focused on Picasso and Matisse)... if the institutions cannot put their finger on the pulse of excellence then they reflect that missed opportunity. For me success means raising one's standards to the highest levels and occasionally getting there (while being realistic and honest). Mack took a middle ground between Modou's fetish of internationalism and my fetish of very high levels of achievement rightly pointing out that not being a great artist doesn't mean you are not successful and there are collateral effects to simply being an artist who tries to do their best. I agreed with this and pointed out that striving for greatness (a term most academic abhor) means that hundreds or thousands of artists go into making any artist of extreme excellence... so it's all related. I like Dave Hickey's descriptions of "Communities of Desire"... artists tend to self select their company and find their own level. 10)We often invite too many to the party and though it's a cliche more isn't rarely ever more. It is a question of using focus as a way to respect the work... this leads to questions of relevancy. Shows are typically over hung, blunting the impact of the individual works. Yes some shows are exercises in networking but at a point it becomes a crisis of relevance. Similarly Portland's civic machinery likes to have a lot of voices involved in any decision. This too blunts the impact of excellence on occasion and we should have several opportunities to single out up and coming projects and individuals that are beginning to show promise. I thought an annual mayor's awards for a wide variety of disciplines (20 or so) singling out those making important contributions would be a nice start. First of all, it is an indisputable fact that the artists (of all ages) who have been flooding into Portland since at least 1999 (often educated outside of Portland) have changed the expectations and awareness of the city as an interesting art city worthy of international attention. Now the New York Times stalks Portland for its edgy funky charm... they never quite get it that it is the permissive arts atmosphere. It all started when the 1999 Oregon Biennial shocked people with multimedia work. In 2002 I staged a show called Play to show just how different things had become and in 2003 a series of large warehouse shows Beamsplitters, The Best Coast, The Modern Zoo, Core Sample and Battle of the Artist Curators all hammered the point home. Portland has been interesting for at least 13 years now but when I first came here all anyone said was "nothing ever happens here." This was decisively proven wrong, since artists chose Portland and now there are new standards in effect. The problem is there are two standards... the old Portland way and the internationally relevant and much discussed new Portland way. Just recently the Wall Street Journal asked if we were "the Next art Capital" (catching the Oregonian with their pants down) and in another even more recent piece the WSJ presented us as a creative "Utopia". This has lead to some grimacing. It is true that Portland now boasts a large # of adventurous non 501.c3 alternative spaces (12128, Appendix, FalseFront, Half Dozen, Breezeblock, Recess, Rocksbox, Place Worksound... etc.) but the fact that none of the granting organizations have grants specifically geared towards supporting their efforts is embarrassing (forcing individual artists to apply for funding turns the granting agency's panels into defacto tastemakers rather than letting established venues simply use their own discretion on what is or isn't worthy). Often the grant restrictions and time frames are not conducive... and most of Portland's best shows are unfunded when even token funding would be very helpful. Years ago the 5K grant for a community project where an artist painted "what it means to be an American" could have easily been better spent. That same 5K in a year spent amongst say 10 scrappy alternative spaces would have a major morale boost and a form of official recognition. Portland's scrappy alternative spaces simply do more with less than any other presenting institution. I'm urging we reevaluate our priorities for relevancy. The arts are not just a feel good exercise in funkiness, taste and standards of excellence are very real things. Excellence attracts excellence... I'm talking about jobs moving here. How do the two Mayoral Candidates Charlie Hales and Jefferson Smith stand on this? What's more many international art stars call Portland home and over the years Harrell Fletcher, Miranda July, Chris Johanson, MK Guth, Storm Tharp and Jessica Jackson Hutchins have all been standouts at the Whitney Biennial without having first had a solo show at the Portland Art Museum (many other artists are showing in high profile national and international venues before getting local props or galleries). What that means is the artists that comprise Portland's art scene are simply more active and ambitious than are institutions/collectors and granting organizations tend to be. That's actually a good thing and natural but with the recent bout of uninspired survey and awards locally the need to point out this schism in dynamism is necessary because a lot of the top talent here does not use or even seek local ladders to gain international acclaim and therefore there is a sense that our presenting institutions and awards are out of touch. For example last year's Contemporary Northwest Art Awards was noticeably not so contemporary. The Portland2012 biennial was diffuse and very academically centered leading to a certain stillborn energy level (more about ingratiating the institution with academics and names than producing a compelling survey) and the Hallie Ford Fellowships also seems to favor somewhat traditional media artists who are key fixtures at teaching institutions (especially this year) rather than names that are doing the best work of their careers that is innovative (having panelists with major academic institutional ties and or previous regional art awards = predictable results). The worst part is all of the awards and surveys seem to churn through the same names repeatedly... overlooking artists who are active nationally and internationally. This celebration of community familiarity OVER internationally tested excellence or a sense of momentum flies in the face of the increasingly international ambassadorship that Portland artists have taken on as a role. Many of these artists work in new media and installation art, which is not represented very well at Portland's top institutions and collections. It is important to note that all off these institutions, be they the Regional Art and Culture Council (RACC), Oregon Arts Commission, Portland Art Museum the art schools have all improved a great deal, it just needs a dramatic adjustment regarding the artists who have started exhibiting here after 1999 (particularly new media and installation art) to bring back good faith. Still there are some amazing efforts that deserve credit. Most notably PAM's contemporary program has brought in a Mark Rothko retrospective and shows by Cris Burden, Mike Kelly and Joseph Beuys definitely set a new standard... The Museum Of Contemporary Craft's Ai Weiwei & Kathy Herrick shows, Reed College's Cooley Gallery are beyond reproach. Still, institutionally, nobody does a better job with local artists than Cris Moss does at Linfield College's Miller Fine Art's Center of picking who is relevant. If you present local artists Moss is who you have to compare yourself against... and that program is in a different class. Let's talk about civic priorities? What if instead of focusing on community as a catchphrase we could be asking, "what kind of community?" ...and "is there excellence within that community that we need to acknowledge?" As a test case Houston has done this. In fact, every aspect of cultural life in Houston is geared towards that city being an "Arts Hub" (ie relevant to anyone on the planet who loves culture). The thing is Portland has not so suddenly found itself become a similar arts hub, but we haven't taken on a similar sense of responsibility for upholding an across the board standard at an institutional level. The closest to this is PNCA which sees itself as a modal "hub" of creative activity in Portland... and not surprisingly they have been the most active institution in the city over the past decade. They have reaped major benefits from taking an open approach, not that they don't have problems within that institutional bubble as well. *Update it was a beautiful event tonight and should enhance the finished article. And on to a suggestion: Although there was some fatigue in evidence about comparisons to the scene in NYC, maybe being born in the Bronx gives me a pass for yet another run at it: have a look at Socrates Sculpture park http://www.socratessculpturepark.org/ as a possible model. Started by artists and their helpers on a brownfield by the East river...and eventually so undeniably vital it entered the city parks system...we've got all the ingredients for a similar showpiece right here. Glad you enjoyed the event... I'm very happy that there was very little whining and there was a lot of honest talk. This essay is a working document and it will change throughout the day to reflect last nights discussion and expand upon it. Specifically to your comment... I want to be clear that the occupation of Portland by artists is definitely not just a youth phenomena and if it came off that way I will take care to make certain that further drafts of this essay reflect that truth. In fact, I believe Portland is a lot like Santa Fe in that it is a good place for artists with a lot of experience to set up shop and stage the second or third acts of their career. There is a lot of freedom here, without the barbed wire of other places and if you've already been around the block a few times that already established network might be very receptive to someone playing the "Portland card". Also, bringing up New York and LA doesn't mean we have an inferiority complex. In fact, many of us recognize the advantages that Portland enjoys over other places... but at the same time we do live with a global outlook and I think Modou's big point was that we should do certain things that would improve our international profile as an art city. 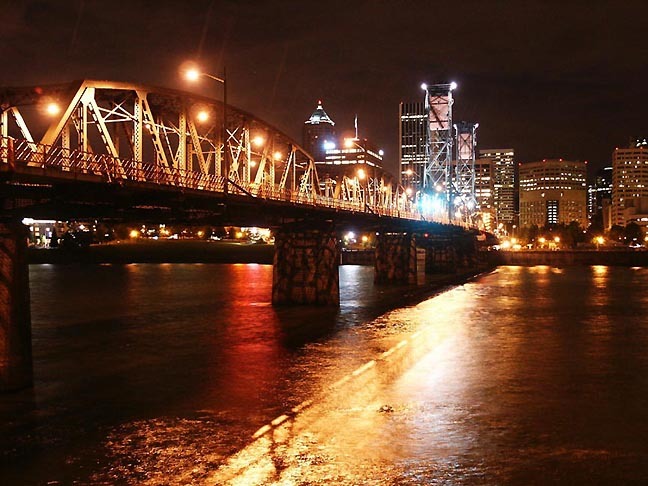 Those things almost always involve creating hosting opportunities for Portland as a destination. I don't think it is the only thing to work on but it is certainly one thing. Yes there are more things along those lines already in the works. Being honest mean comparing ourselves... honestly. LA and New York as well as London, Chicago, Houston, Berlin and Des Moines are all quite different but each can tell us something valuable about what we do well and not so well. Look at Chicago... great museums and architecture. They play second fiddle to no one... yet they don't see themselves in a very positive light as an artist's city. It is odd... a kind of second city inferiority complex. Portland doesn't have that... we are one of the main capitals of the world "indie industrial complex"... we can define success in our own ways and considering the amount of attention we get it is obvious that we have things that others are envious of. The thing is we should maximize this moment, that's what my Op Ed was about in January. Some are making the most of this moment, some are not.